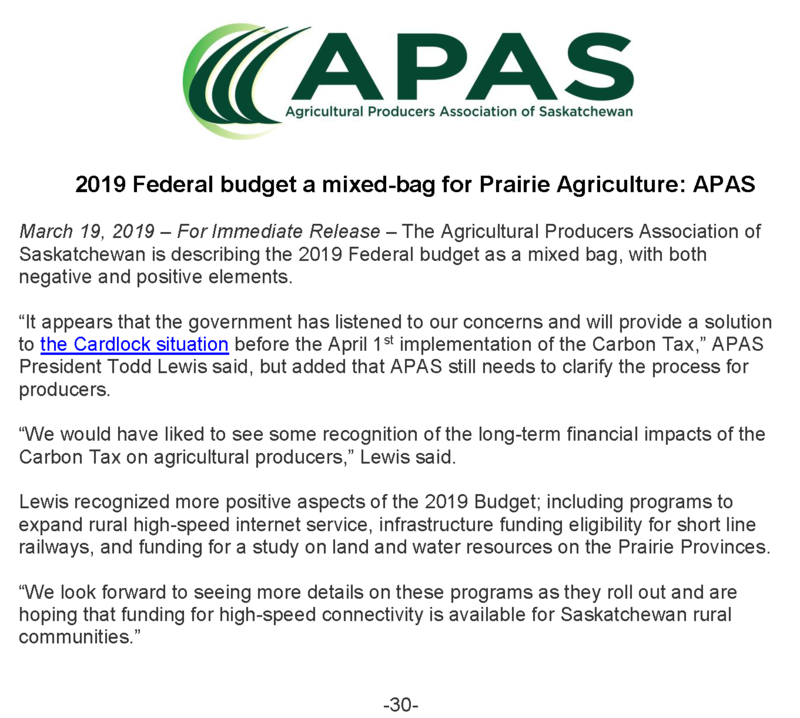 March 19, 2019 – For Immediate Release – The Agricultural Producers Association of Saskatchewan is describing the 2019 Federal budget as a mixed bag, with both negative and positive elements. “It appears that the government has listened to our concerns and will provide a solution to the Cardlock situation before the April 1st implementation of the Carbon Tax,” APAS President Todd Lewis said, but added that APAS still needs to clarify the process for producers. “We would have liked to see some recognition of the long-term financial impacts of the Carbon Tax on agricultural producers,” Lewis said. Lewis recognized more positive aspects of the 2019 Budget; including programs to expand rural high-speed internet service, infrastructure funding eligibility for short line railways, and funding for a study on land and water resources on the Prairie Provinces. Background: APAS is Saskatchewan’s general farm organization – formed to provide farmers and ranchers with a democratically elected, grassroots, non-partisan, producer-run organization based on rural municipal boundaries. As the united voice of agricultural producers and ranchers in Saskatchewan, we strive to represent the views of a wide variety of agricultural stakeholders in order to form comprehensive policies that can benefit all sectors of society. APAS is a member of the Canadian Federation of Agriculture. Learn more at APAS.ca.